Patrick Marber brings Eugène Ionesco’s 1962 tragi-comedy Exit The King to the National Theatre for the first time with a sharp injection of wit, and a high dose of cartoonish energy, peppered with serious soliloquies that will leave you searching your soul. Bleak? Not a bit of it, this is a pantomime-style comedy with larger than life characters. More so than a tragedy, as, really, how sad can we feel about the death of a decrepit 483-year-old ruler who’s long outstayed his welcome? No, the tragedy is felt deep within ourselves as we imagine standing in his shoes. There’s no ‘spoiler alert’ needed in telling you that the King dies before the play is through. The King simply refuses to believe it and so our players must convince him to accept it before time runs out. As The Doctor (Adrian Scarborough) sporadically counts down the minutes, I found myself simultaneously hoping the king might yet find a way out whilst yearning to see it happen. The very definition of morbid curiosity. Bérenger’s two wives, oh yes, he’s been quite the cad of a King, Queen Marguerite (Indira Varma) and Queen Marie (Amy Morgan) are polar opposites. Marguerite is stoic, long suffering, and practical. Ready to take over what’s left of the crumbling kingdom, she urges the King to accept the inevitable, and scolds him for not spending more time preparing for the end. His second wife, to all intents and purposes his mistress, Queen Marie, weeps like a lovesick schoolgirl over his impending doom, indulging his fierce, stubborn rebuttal of the fact at hand. 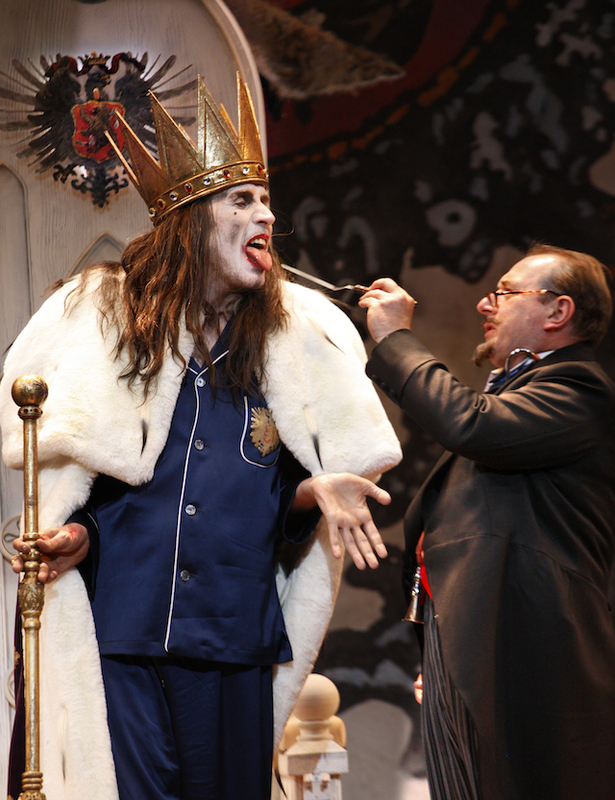 The laughs begin as polite titters for the OTT performances from King Bérenger (Rhys Ifans) and his servants (Debra Gillett as Juliette The Nurse is exemplary in bringing much of the light relief). Some of the gags fall flat but once Ifans takes to the stage wearing a robe of truly monarch-length proportions he brings welcome belly laughs as he staggers around his throne, clearly infirm, yet in firm denial. Breaking the fourth wall often, he wins favour with the crowd, we ‘his subjects’ as we watch his servants fuss around him during his final minutes. It’s a treat – and worth the ticket price alone – to watch Rhys Ifans bring impeccable physical comic timing to the role juxtaposed with several moving monologues which take you entirely by surprise as tears begin to fall. ‘He thinks he’s the first person ever to die,’ sighs Marguerite. ‘Everyone is the first person ever to die,’ counters Marie. A sage point. We nod along in agreement and amusement as the play examines the stages of grief – denial, anger, bartering, depression and acceptance. We all know that time will one day run out but it’s no less tragic to each and every person affected by the loss. Death is the only guarantee we have in life and yet, we live as if it will never catch up to us. The King foolishly believed himself immortal, he whines like a petulant child, he mourns the life he’s lived and the life he’ll no longer go on enjoying. Patrick Marber’s vision of Ionesco’s classical play, coupled with impressive set design and staging, is well executed. The finale sees us witness the king’s solemn, dreamlike descent into an ever-growing expanse stretching into the dark reaches of an inescapable abyss. Does Bérenger reach acceptance over his death? I couldn’t possibly divulge. You can be certain, though, that the king will die and you will feel mournful, perhaps not for him, but for your own finite existence.